“Tolerance” has become one of the cornerstone virtues of an “enlightened” and “compassionate” person, according to secular culture in America. Public schools aggressively teach students “tolerance” and present it as the ideal for someone who doesn’t believe in silly notions such as God, or even definitive right and wrong. The irony of the proponents of tolerance is that they often smugly lecture Christians, who are viewed as intolerant and backwards. While the world has set forth tolerance as the litmus test for sainthood, Jesus taught that love is the true test for his disciples. But I submit that tolerating others, or simply “putting up with” people who look, act, and behave differently doesn’t make someone a wonderful person. It’s not a challenge to jump over such a low bar. “For God so tolerated the world that He gave his one and only Son…” (John 3:16). “A new command I give you: Tolerate one another. As I have tolerated you, so you must tolerate one another” (John 13:34). These passages do not have the same ring. Can you imagine if Christians only tolerated people rather than loved them? I could give it a shot. Maybe tomorrow morning I will wake up and tell my wife, “Honey, I promise to tolerate you today.” I don’t think that will spur on any romantic moments in the near future. Or, I could pat myself on the back for reminding my son and daughter how much I tolerate them each day. How would that make them feel? Far less valuable then when I tell them I love them. 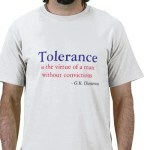 But apparently, tolerance is the standard we ought to achieve. The reality is that tolerance is the Common Core of relationships; a low standard packaged as a spectacular new advance in human progress. Jesus taught something different. We need to love others unconditionally by putting their needs above our own. 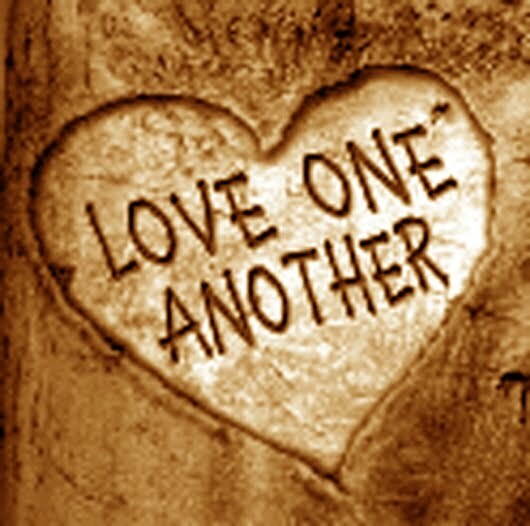 We need to further love others by sharing with them the love of Jesus who died for their sins. To withhold this message is the opposite of love and allows your friends, neighbors and enemies to continue living destructive lifestyles that harm themselves and others. And for those who religiously believe that tolerance means acceptance of others, please know that it actually means that you stand for nothing. And for some in America today standing for nothing is the ultimate of all virtues. The non-virtue virtue. Instead, let’s allow God to produce the fruit of the Spirit in our hearts and minds: love, joy, peace, patience, gentleness, goodness, faith, meekness, self-control (Galatians 5:22-23). Only in this we will find peace, joy and salvation in the God who loves us, and doesn’t merely tolerate us. This entry was posted in Biblical Worldview, Education, Family, Uncategorized. Bookmark the permalink. Post a comment or leave a trackback: Trackback URL.